Aisle Cases are classics for merchandising items on an “Aisland”. 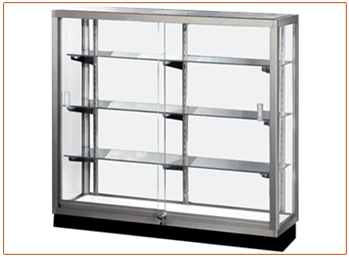 Extensive 54” high display area and glass back offer great display area and give your customers an all-around view of your items. You may want to create an entire aisle using these all glass showcases. Aisle showcases come in a few lengths, so select the ones that fit your layout best. Aisle showcases are 60” high. Glass display area is 54” high with sliding glass doors and a glass back. Black kick base is 6” high. Overall height is 60”. Cases are 18” deep and are available in 4 lengths. Complete with 3 rows of adjustable 12” deep glass shelving. Prewired and ready to plug in.